Last post, I configured quorum configuration of Hyper-V Cluster. 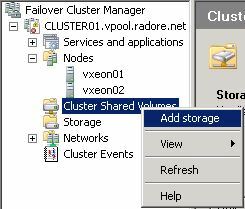 Now it’s time to enable Cluster Shared Volumes for Cluster. I created a 1 TB disk from SAN. Then I add it from Storage section. Now we see it under the Available Storage. 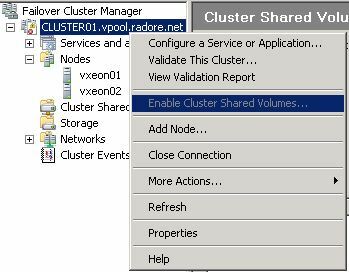 Then enable Cluster Shared Volumes for Cluster. Then add your disk to CSV with Add Storage. Choose your 1 TB disk for Cluster Shared Volumes. Done. 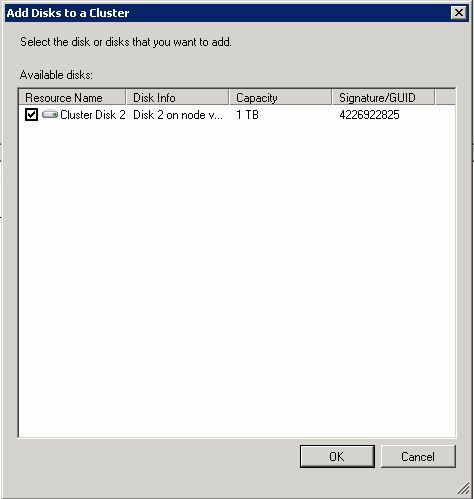 Now your disk is available in Cluster Shared Volumes. Now you can see your disk at C:\ClusterStorage.